Last week, I visited the largest organic avocado farm in California. 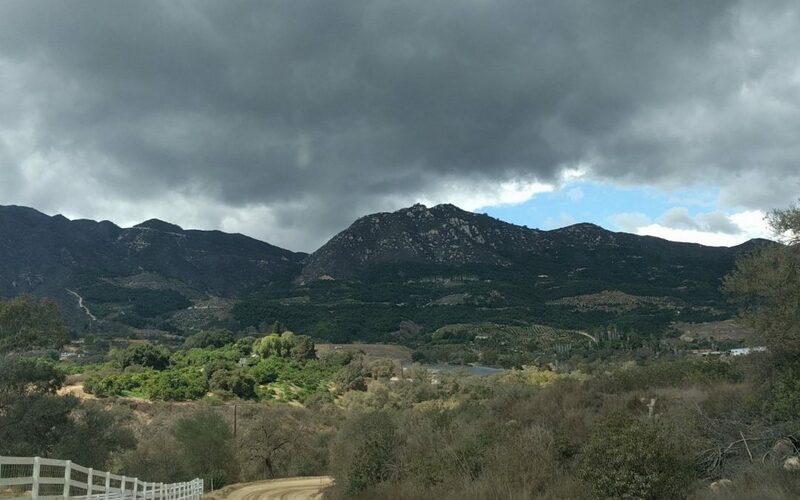 It’s those hills in the photo above — they’re covered with 1,000 acres of avocado trees. And I felt vindicated when I saw that they care for the soil under their trees in essentially the same way that I do. But I’ll get to that in a minute. First, let’s say what our goal in growing an avocado tree is. For me, it’s a consistently fruitful tree, which means it must also be healthy. And how does soil fertility affect our achieving this goal? 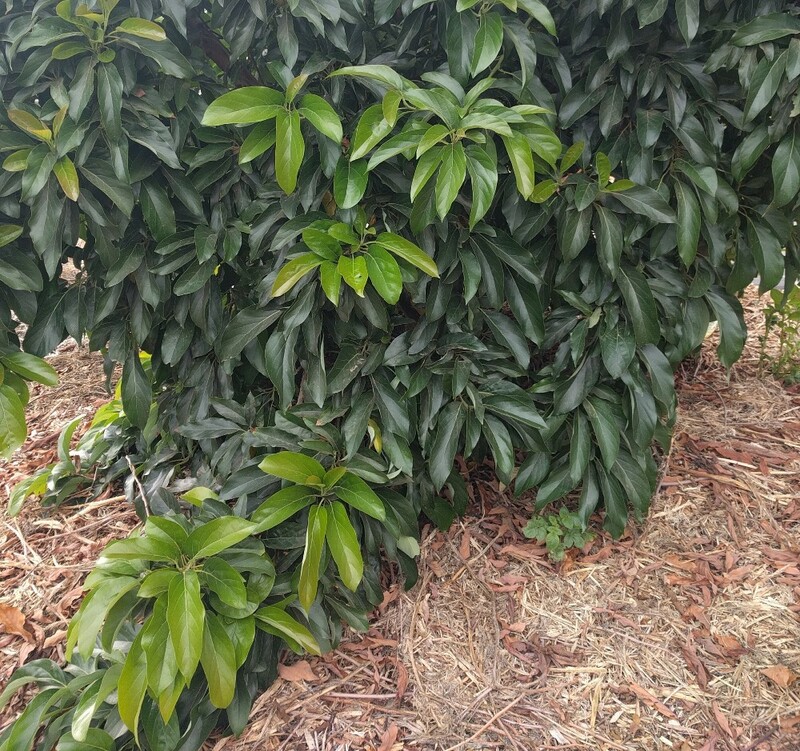 Avocado trees, like all plants, need certain elements to run their systems properly and produce fruit. So we add stuff to our soil when necessary. 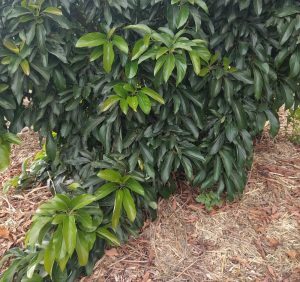 So, the soil in your yard may have all your avocado needs, but commonly in California, avocado trees need added nitrogen and perhaps zinc. How do we know if this is the case with our own particular soil? You can get a sample of your soil (or leaves) tested by a lab such as Fallbrook Ag-Lab. But maybe you’d like to give it a little boost, a little extra just to make some bonus fruit? It doesn’t quite work that way. More recently, a study by Mary Lu Arpaia and her colleagues, published in the 1996 CAS Yearbook, additionally found that “. . . fruit size from the high nitrogen trees tend to be smaller.” Also noticed was “a decline in post harvest quality of the fruit coming from the trees high in nitrogen.” The term “post harvest quality” refers to things like ripening properly with normal coloration and without rotten spots. Therefore, to achieve our goal of a healthy tree that produces much fruit, we can periodically test our soil and leaves, but more easily we can simply keep an eye out for foliage that lacks the expected, uniform deep green color. What isn’t called for is blindly adding fertilizers as a matter of routine. Adding more than enough is not better. I’ve seen many trees that appeared sickly, yellowish, nutrient deficient, only to poke into the soil and find it soggy. That’s a watering problem, not a fertility problem. Here’s a specific example. This tree wasn’t watered often enough when first planted, so leaves burned. Then it was watered too much too often, so now it has yellowish foliage. When I was new to growing avocados, I saw such a senescent leaf on my tree and worriedly sent a photo to an expert for advice. Lack of fruit, as a single symptom, should not be taken as caused by nutrient deficiency, by the way. Avocado tree fruit production is always fluctuating due to natural alternate bearing, more and less conducive weather, bee activity, etc. After all of your care for the tree has been considered, and you’ve gotten your hands dirty feeling the soil and judging your watering practices, and the last possibility is that your soil is deficient in a nutrient, then . . .
. . . you can feel confident that buying a fertilizer product that will improve things. Go to a nursery and they should be able to provide you the right product. You can usually choose an organic or synthetic option. For example, if it’s nitrogen you’re lacking you can get E.B. Stone’s Citrus and Avocado Food. Apply it by following the label directions. It ought to do the job. I’ve seen innumerable beautiful and fruitful avocado trees fertilized in this general way. 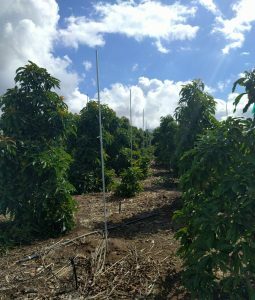 In fact, on the same day that I visited the large organic avocado farm pictured above, I also visited a smaller organic avocado farm. At the smaller operation, the farmer told us that he fertilizes his trees using Peruvian seabird guano that is injected into his irrigation system. In addition, when he planted his trees three years ago he had added a layer of wood chip mulch. “I wish I could add more mulch because I’m really convinced that it increases the soil’s cation exchange capacity,” he said. Some mulch around his trees, but more would be better, the farmer says. He wishes he could add more mulch? What’s stopping him? Even if he gets the mulch for free, imagine the costs of spreading such a bulky material under hundreds of trees. Injecting fertilizers into an irrigation system is far cheaper. 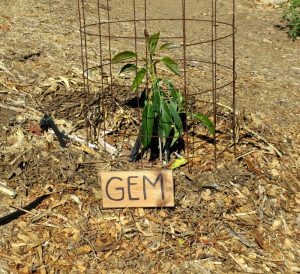 Nonetheless, beneath the tens of thousands of avocado trees at the other farm, the largest organic avocado farm in California, there is new mulch being added consistently. They make their own right there on the farm. Using massive, expensive machinery, they take green waste (pieces of plants and trees), mix in some animal manures, compost it in long heaps, and eventually spread it under their trees. As I mentioned earlier, I felt a sense of vindication seeing such a large operation treating their trees this way because . . . look what’s under my trees. Even around the babies, I build it up. The large avocado farm uses a special machine to blow out and spread the mulch under trees, saving time and labor. But it remains a much more expensive way to add nutrients to the soil. There is a bigger economic picture to see, however. 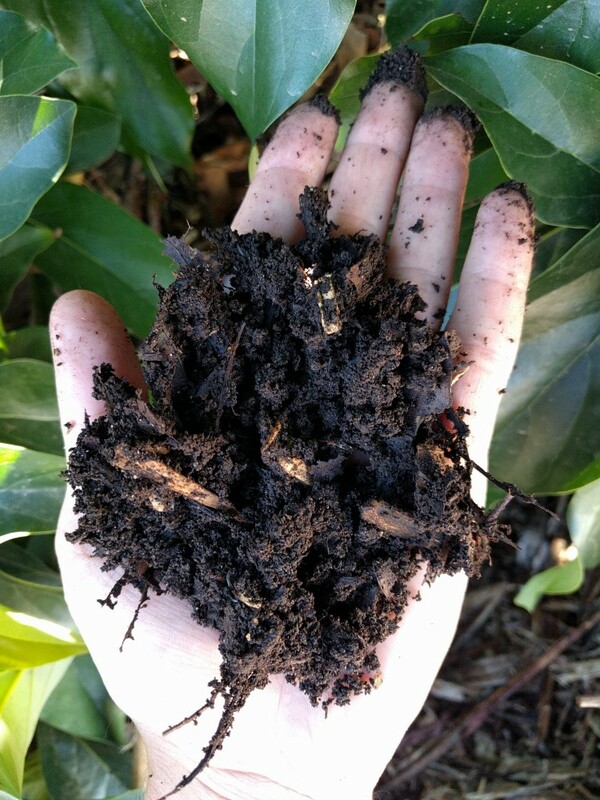 The mulch not only breaks down to add nitrogen and other elements in order to act as a fertilizer, but it also functions as an herbicide by covering weeds, as well as a soil conditioner that improves water intake and holding, and a disease suppressant, etc. How much is all of that worth beyond the fertility effects alone? We are killing many birds with one mulch stone. I add a little horse manure from my neighbor occasionally, a bit of my chickens’ manure, plus a lot of random plant materials. But more than any other single element, I mulch with lots of wood chips from tree trimmers. This stuff is bulky with big chunks, and avocado roots enjoy this characteristic for two reasons. It ensures that the mulch remains airy. You’ll find roots poking their heads up into it. The chunks of wood also feed bacteria that consume the wood’s lignin by producing an enzyme called cellulase, and this enzyme breaks down the cell walls of the fungi Phytophthora cinnamomi, the organism that causes the root rot disease in avocados. 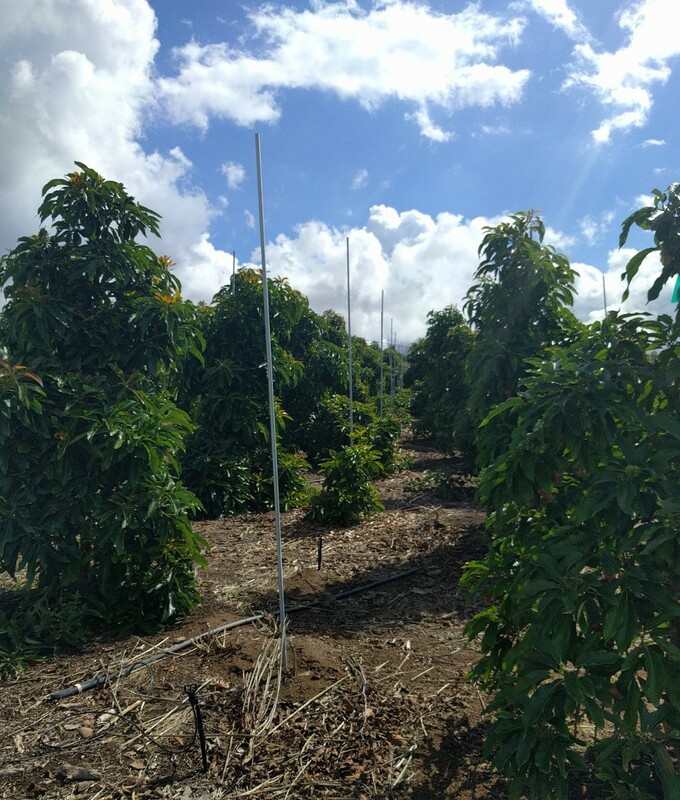 Our guide on the tour of this large avocado farm’s mulching operation was the farm’s manager along with Mary Matava, who has been working with fertilizer, mulch, and avocados in Southern California for four decades. She is an agronomist and the owner of Agri Service, the company that runs Oceanside’s El Corazon compost facility. 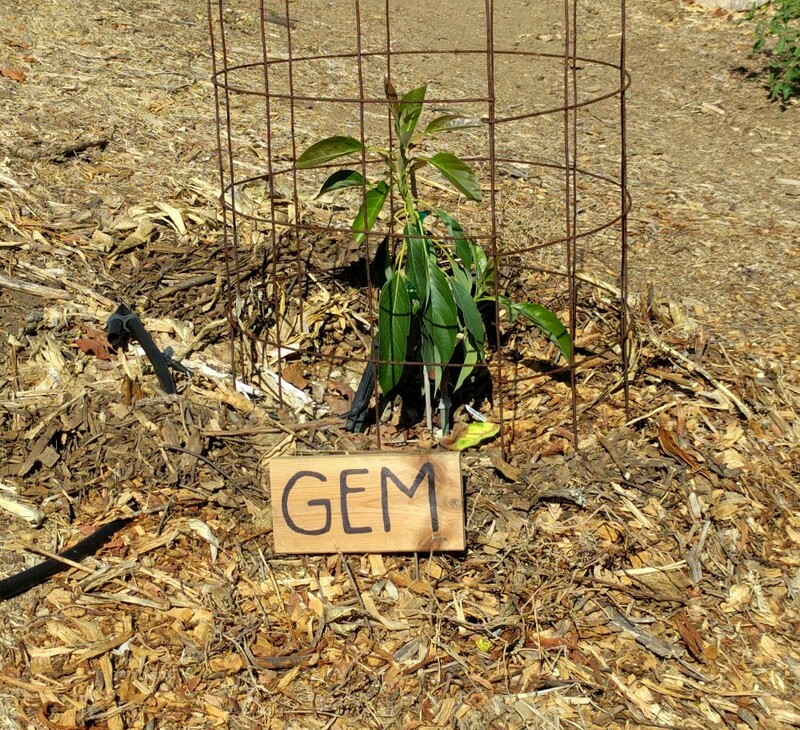 Matava reminded us to consider the avocado’s sensitivity to salts when mulching. Wood chips and greenwaste compost are usually low enough in salts to not worry about (although greenwaste compost can be surprisingly salty if it is made in a hot and dry location using salty irrigation water), but mushroom compost and manures should be applied with more caution as they are higher in salts. If applying mushroom compost or manures, it is ideal to apply them in winter so that the rains can leach the salts, said Matava. About five inches of rain (or irrigation water) should suffice. Then come spring, when avocado roots again become more active, the roots won’t have to deal with salty soil as the salts have been driven below the level of the roots. As for how much organic matter to add to the surface under your avocado tree, that’s hard to calculate with any precision without some serious testing and quantifying of the materials. I don’t bother. I merely make sure that the soil is always covered. I add more materials whenever the layer is thinning out. This very simple approach has worked well for my avocado trees. After a few years of constant coverage, the mulch-soil interface layer starts to look and feel like a forest soil. Intuitively, you look at the color, you smell it, you feel it, you just know it’s fertile. Black, fragrant, sticky, able to give the tree all it needs. And some good news: Gary Bender writes, “However, it is not necessary to apply the same amount of organic matter each year because mineralization of nitrogen, after a high release rate the first year, declines to a release rate of 5% – 6% per year from the initial application. Therefore, as the years go by, application rates of organic matter should gradually decline so as to achieve a steady release rate on nitrogen in the soil.” The organic matter sticks around, quite literally, and is able to feed your tree for longer than other fertilizer options. Why did I feel “vindicated” upon seeing the investment into mulching that the large avocado farm had made? I was low on self-confidence, I suppose. 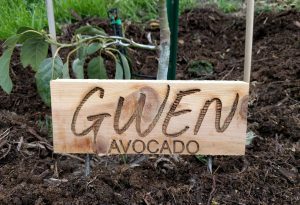 I had been the only one I knew growing many avocado trees without adding fertilizers, with only mulching, and I wondered if I was fooling myself — despite the fact that I could see my trees growing and producing well year after year. I’m now feeling more confident in the long-term sustainability of the way in which I fertilize my avocado trees, which is to not fertilize them at all, in the sense of adding what we usually think of as fertilizer. Rather, I merely mulch. good reminder to switch up the fertilizer and i’ll check out the EB one. been trying to find a cheap source of mulch though. need to cover a good amount of space. harder to find organic mulch (or is that not necessary?) local big box stores only really have the Kellogg’s Gromulch that i can find. would that work? 2018 has been an anomaly, no year to judge avocados by in general. It has been the worst year in my personal experience. Hope it stays that way. Have you seen my post, “Where to get wood chips for mulch”? As for organic, it is my understanding that certified organic avocado farmers are able to use any mulch that has gone through a composting process that is hot enough to kill pathogens and break down pesticides even though some certifiers give growers a hard time about this. As for whether that’s acceptable to anyone personally is another issue. Realistically, the only way you’re going to know the sources of any mulch is if you create it yourself, which is possible but pretty difficult if you need a large quantity. thanks..been on the chipdrop list but been afraid to confirm and then find myself one day with a giant load of wood chips haha. i’ll keep my eye out for tree trimmers and see how that goes! Question: My Reed has been in the ground for almost a year and is about 6 ft tall. I noticed over the past to weeks some yellowing on about 30% of the leaves on my tree- They’ve turned a kind of light green/yellow but the other 70% are perfectly dark and with no signs of trouble at all. Should I be concerned? Probably nothing to be concerned about. Do the leaves look like the photo of Reed leaves toward the bottom of this post? Sounds like a few leaves just dying a natural death. Thanks for the great info. 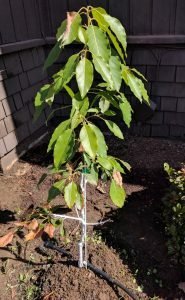 I’m new to growing avocado trees having moved to Fallbrook 2 years ago. I’ve been working on getting the trees on our property in shape with knowledge gleaned from your posts. Were the big growers affected by this summer’s heat? No doubt that July heat hit the big growers just as it hit us. 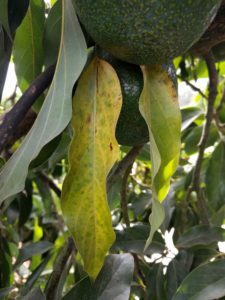 I’ve driven around a lot in the past few months looking at avocado farms between San Diego and Santa Barbara and seen a spectrum of grove health. A couple of patterns are obvious. The closer the trees are to the beach, the less they were affected by the early July heat simply because there wasn’t as much heat there. It only got to around 100 near the beach, which is nothing compared to the 115-plus experienced inland. While driving the 126 through the Santa Clara River valley I saw perfect groves near Ventura and scorched groves near Piru. Also, people who were on the ball with watering their trees before and during the heat came through pretty well. Specifically, they may have lost fruit, but they didn’t lose full trees. I’m inland, where it got to 117, and I lost some fruit, but thank God, I didn’t lose any trees. We have used the free mushroom compost from Mountain Meadows Mushroom farm in Escondido in years past. Free is a great price! But thanks for the tip to change it up and not always use the mushroom compost. Thanks for mentioning the mushroom compost. I had wanted to say something about its saltiness as well as the salt levels of manures — salt levels being important since avocados are so sensitive. This afternoon I’ll add some information about that in the post. Thank you for taking the time to write these posts!!! My Kona Sharwill avocado that I got from Atkins Nursery, per your suggestion, is growing like crazy(300%+ growth). My Reed avocado has very green leaves but no desire to grow like crazy as the Sharwill. It seems to me they are doing good/wonderful because of the thick layer of wood chips that I put on top of their soil. I live in a city and horse manure is not readily available, so EB fertilizer will be considered, If my trees ever need help. I will be watching closely because despite of all my efforts, I don’t have fruit to show for it yet. That’s great news. I hope your trees flower well this spring and set their first crop. A couple things- I’ve been using the job’s organic citrus and avocado fertilizer from Lowe’s- any insight on its quality? My reed seemed to react well to it but I’m confused on how often I should fertilize? Some sources say spring, summer and early fall while others say only once per year. I also took your advice on the mulch and will now look for organic wood chips from a local trimmer- thanks! Lastly- I bought a small bacon avocado tree to cross pollinate the reed. It’s still in its 15 gallon pot that I’ve placed about 5 feet from my reed- is that a good/perhaps “best” cross pollinator or should there be another I should be looking for? Ps- I’d love to come see your property! I live in Long Beach and am completely fascinated with avocado growing now! Let me know if you’re up to it! Thanks for the great comments. I saw the Jobe’s Fertilizer Spikes for Fruit and Citrus at Lowe’s the other day. If this is what you’ve used, I’d hesitate to continue using it. The first thing that jumped out at me was that the analysis on the label says the source of potassium is potassium chloride. 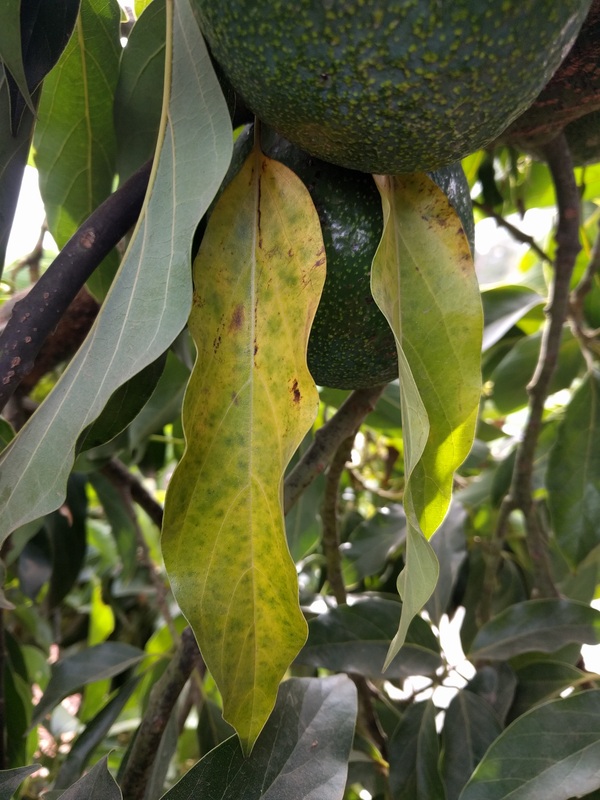 Avocados are very sensitive to chloride, and there’s already more than the trees can handle in the irrigation water we use in Southern California. I’d hold off on any further fertilization until the tree shows a need, especially if you add some wood chips and/or compost under the tree sometime soon. The good news is that Reed trees fruit very well without any B-type avocado tree nearby. For example, my Reed fruits well and the closest B is 250 feet away. To most optimally use that Bacon as a pollenizer, place it so the branches are just touching the Reed. You want the bees to consider them as a single tree, which makes them more likely to visit the flowers of both trees at one time, on a single feeding flight. That being said, in my yard the only B-type avocado that still has a lot of flowers through May and even into June when Reed peaks in bloom is Fuerte. Fuerte has a very long flowering season. So it’s at least a potentially good pollenizer for Reed. I’ve been thinking of inviting some people over to see my yard. I imagine it makes readers curious as to what the whole thing really looks like since there are many glimpses in photos here and there. It’s likely to disappoint, I fear. Still, maybe we can do a little tour day. I’ll talk it over with my wife and get back to you about it either via email or through a post on the website here. Anyway, glad to hear you’ve caught the avocado bug. Unfortunately, it seems there’s no cure. Hi Greg. 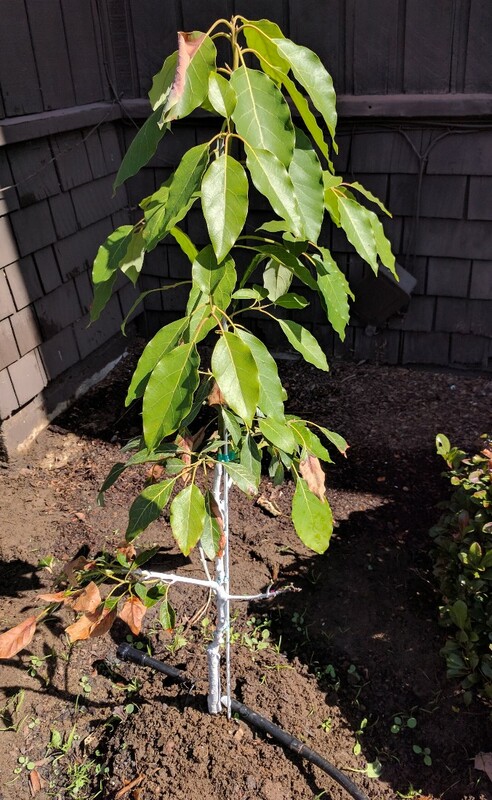 I was wondering if you could tell me what I’m doing wrong with my avocado tree. The skins are very thin and the avocado, although a fairly good size, gets mushy on the bottom 3rd yet still hard on the upper 3rd of the avocados. Our tree is maybe 5 years old now, it has given us avocados for 3 years yet we haven’t really been able to eat them yet. The first year I picked them too soon. The 2nd year, the heat got to them, the 3rd year which was last year the heat also got to them but 3 survived. They are the mushy ones and the bottoms have a dark spot on them. I forgot what type of avocado they are but look so much like Hass and they are as long as my hand. Thanks if you can help me figure out what to do. I’d really like to see a photo of this fruit, as well as the tree. That would clue me in to a lot of what you are experiencing. I’ve just planted a 15 gallon fuerte at my new house. I’ve followed your watering and mulching tips. Some of the lower leaves are a nice deep green and some of the upper leaves are a pale green/yellow. How soon should I apply a nitrogen fertilizer and how fast could I expect all the leaves to turn that nice deep green color? Good questions. Avocado leaves only turn a deep green once they’re mature. Younger leaves are more of a lime green color, and new leaves are even reddish. So your tree sounds like it looks as it should, with the lower leaves being a deeper green. It doesn’t sound like it is in need of any fertilization now. Does this info apply to orange trees? Is mulch enough for them too?